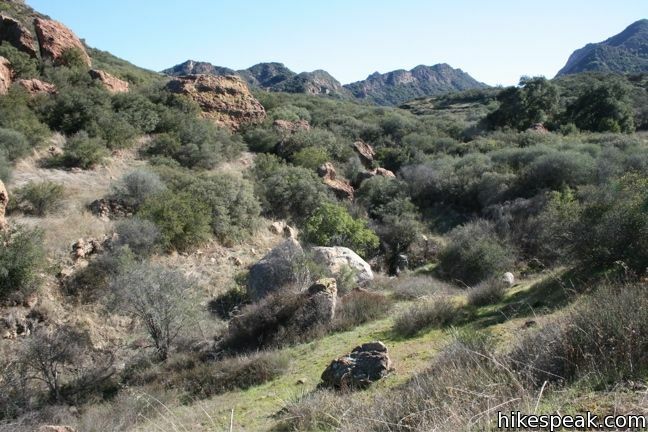 Lost Cabin Trail is a 0.75-mile long dead-end single track departing from Crags Road near the location where the MASH television show was filmed. 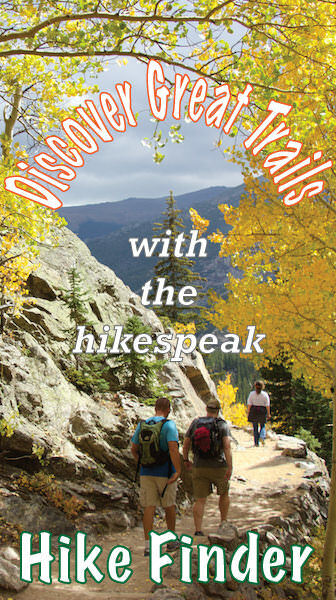 The trail ends in a mountain canyon at an empty plot where a cabin once stood. 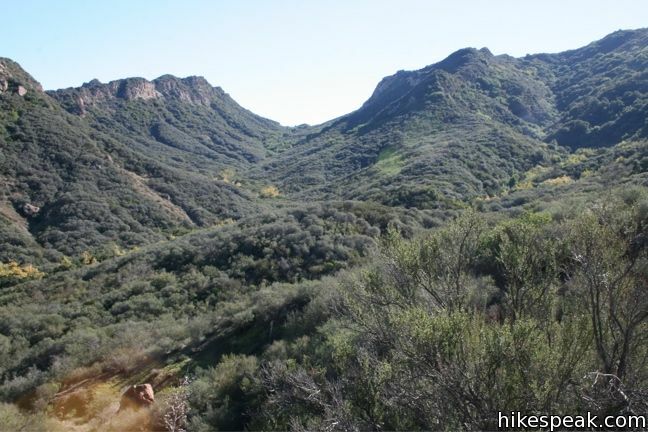 Though there is no longer evidence of the cabin’s existence, the trek still offers hikers immersion into a remote section of Malibu Creek State Park behind the Goat Buttes. 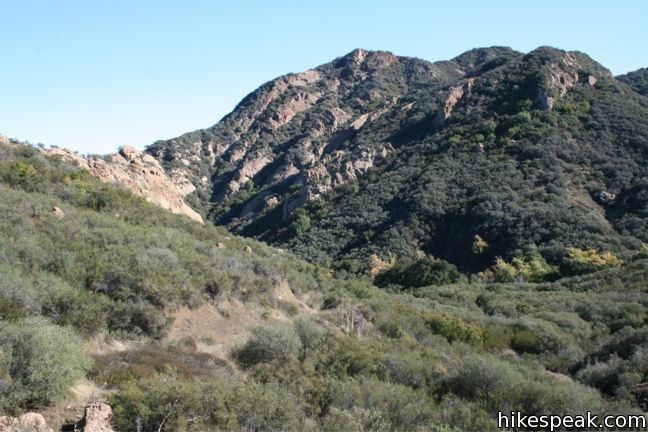 While the views are not so sensational as to attract a lot of hikers, Lost Cabin Trail provides a pleasant 1.5-mile extension to the MASH site hike for those looking to get a bit more out of their visit to the park. 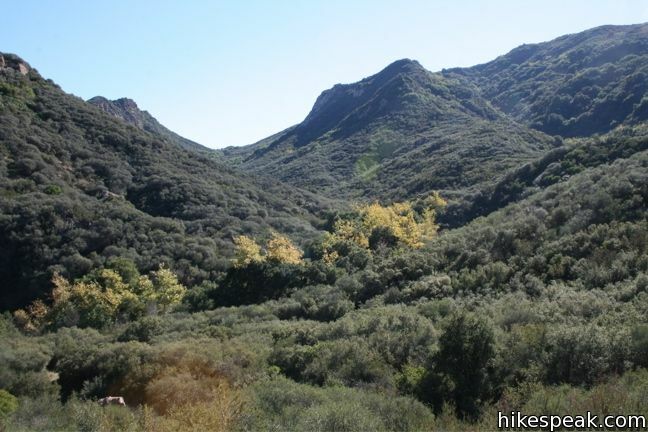 Woolsey Fire Update: Lost Cabin Trail and most of Malibu Creek State Park have reopened following the November 2018 Woolsey Fire, which burned through the park. 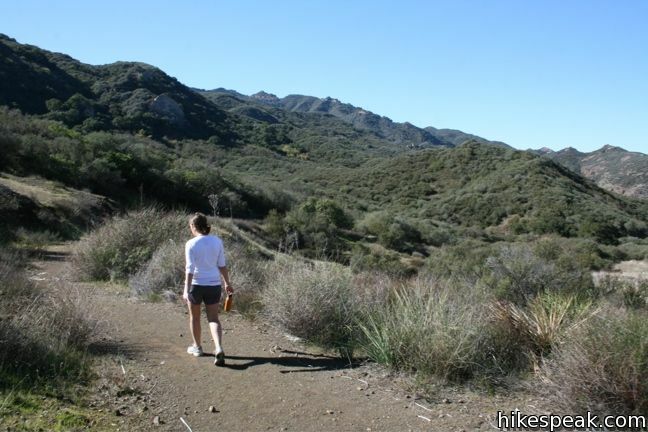 Check the Malibu Creek State Park page for more information. 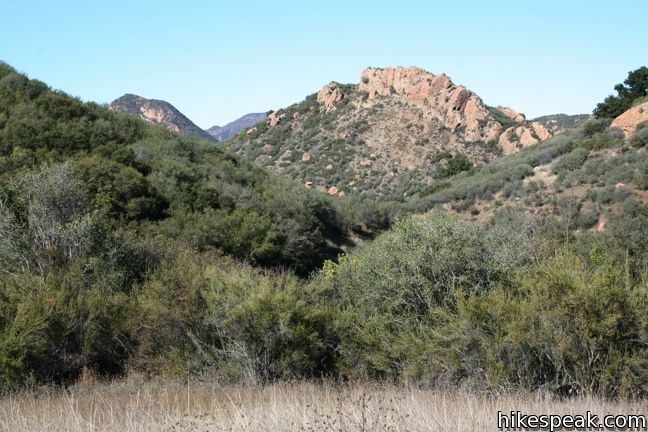 From Crags Road, a couple hundred feet east of the MASH site (and 2.35 miles from the park entrance), turn southwest on a narrow track labeled Lost Cabin Trail. 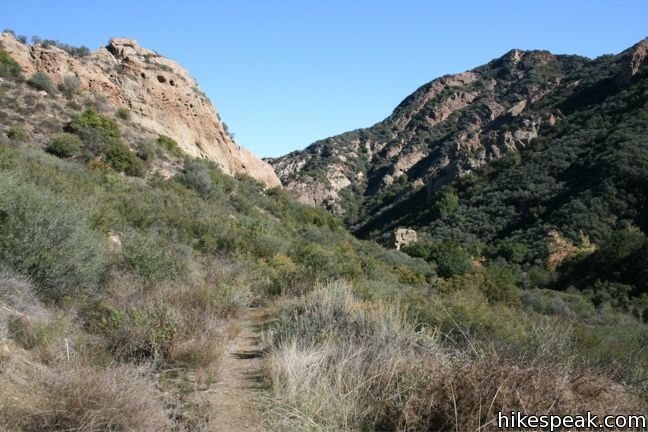 After a short distance, the trail ascends to a saddle in a low ridge with a nice view up and down the range. Lost Cabin Trail continues over the ridge into a fan-shaped mountain canyon. Descend the slope along the left side of the canyon, before crossing the creek bed, and coming to a sudden stop at the site of the Lost Cabin. 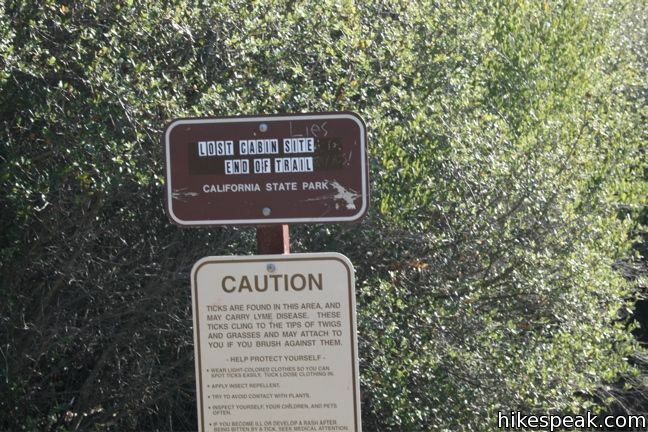 A sign is actually posted to declare that the trail is over, which is the only indication that you have arrived at the location of the now-vanished cabin. The trail becomes faint and harder to follow toward the end, and since the Lost Cabin site is so anticlimactic, if you decide to turn around early, you won’t be missing much. This is a dead-end trail, with no junctions along the way. After reaching the Lost Cabin, return the way to came for a 1.5-mile extension with 190 feet of elevation between Crags Road and the high point of the trail. 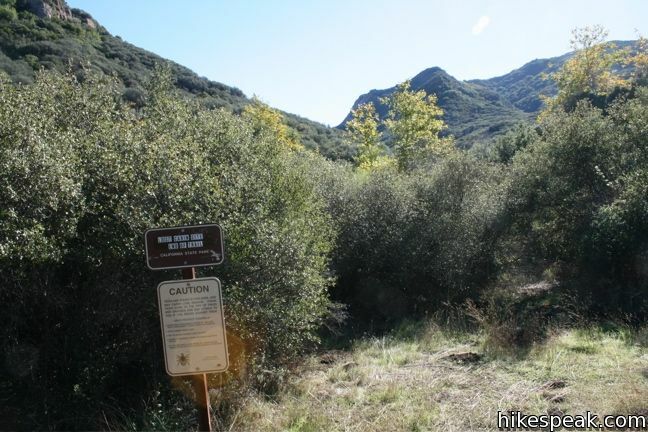 To get to Lost Cabin Trail: Hike in to the former MASH set along Crags Road from any of the access points to Malibu Creek State Park, including South Grassland Trail, Cistern Trail, and the main park entrance. 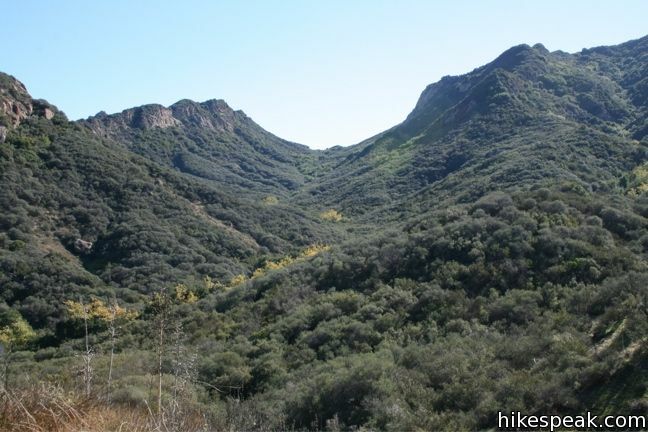 The main entrance to Malibu Creek State Park is located on the west side of Las Virgenes/Malibu Canyon Road between the 101 and PCH, 6.1 miles from the coast (just south of Mulholland Highway). A $15 fee is charged for each vehicle parking inside the park. Parking is also available outside the park. 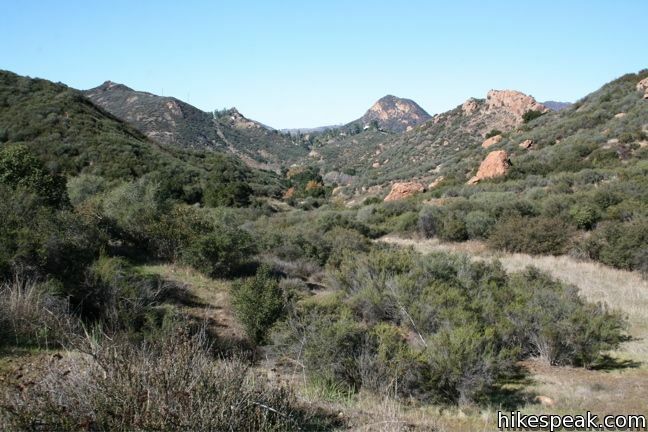 In the late 40s early 50s, Ron and Nancy Reagan owned a ranch at mulholland hwy and Malibu lake, now one of the park facilities and parking lots …. movie he and nancy rescue a group of asian children.